The US Coast Guard Sector Hampton Roads is headquartered in Portsmouth, Virginia. Sector Hampton Roads is responsible for marine safety, disaster relief, environmental protection and law enforcement within the region. Ports and regions that fall under the responsibility of Sector Hampton Roads include Newport News, Norfolk, Portsmouth, Quantico, Richmond, Virginia Beach, Yorktown, Jamestown and Chesapeake. 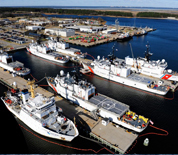 This USCG Sector Hampton Roads directory features the critical info you’ll need to navigate through the many facilities and recreational opportunities available on base.